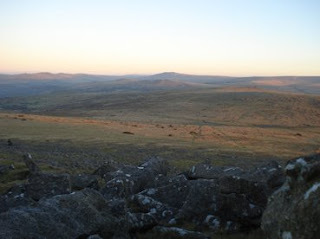 I had the opportunity to watch a sunrise on Dartmoor one cold, late December morning. I parked the car in my usual place and, with frost on the ground, a perfectly clear sky and a freezing wind pouring off the moor, I began to wonder if it was such a good idea. With plenty of warm layers and with a faint hue of blue in the east amidst the darkness I set off. Sharpitor was a good half hours walk away up over the moor and I decided this would be a good vantage point. Fortunately I knew the tracks in the area so walking in the darkness was quite straightforward. I hoped that once I reached the top of the tor I would be able to shelter out of the wind behind the rocks. The walk was easy going, but once I reached the rocks just below the tor the strength of the wind made be watch my step with care. The sky was lightening now and I managed to shelter just as a sheep might do behind some of the large rocks. The wind was coming form the east so couldn't l couldn't directly face the sunrise but, from where I huddled, I could see south over to Burrator reservoir and beyond, west to Tavistock and Kit Hill and north up to Brent Tor. A huge panorama spread out beneath me. As the lightness increased the orange glow of the street lights and houses in the built up areas began to fade and the subtleties of the Devon natural landscape began to emerge out of the darkness - the hills, woods, fields and hedges. In the sky a long pinkish band of haze appeared and moved westwards as the rays of sunlight hit the atmosphere above me before the sun appeared on the horizon. 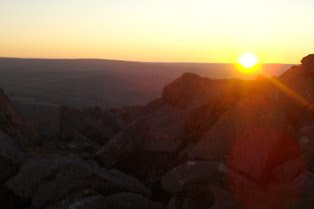 It was a long and chilly wait before the first golden rays of light lit up the tops of moors around me and I braved the wind to peek out from my shelter to see the golden sun just appearing over the central mass of moor in the east. I awake to the song of the earth. I awake to the winter's light. I awake to the dance of life. By now I was freezing cold and decided I had to go down into the woods to find shelter. I always like to watch the sunrise and making it a special event is always worth doing. I spent the day wandering around Burrator Reservoir and trying to do some drawing. The wind quite strong and cold and very few places afforded shelter and the promise of some warm sunshine. I finally warmed up after lunch after I had given up drawing and I had to go for a long walk to warm up. In the strong winter sunshine the colours were superb and I just walked and enjoyed them.